File consists of photocopied material regarding the Aleza Lake Experimental Station from BC Archives. John Revel - "The Effect of Browsing by Columbia Black-tailed Deer and Sooty Blue Grouse on the Establishment of Conifers on Vancouver Island, British Columbia"
John Revel - "Reforestation in the Vancouver Forest District (Plantation Assessment)"
File consists of:Photocopied version of John Revel's problem analysis entitled "Reforestation in the Vancouver Forest District (Plantation Assessment)" for E.P. 585 with the Research Division of the BC Forest Service. John Revel - "Silviculture in Spruce-Alpine Fir Types in the North Central Interior of British Columbia"
File consists of:A computer database print-out of photographs held at the Fraser-Fort George Museum that relate to sawmills (as of 1993)The Fraser-Fort George Museum's "Northwood Archives Donation Inventory"
Ralph Schmidt - "The Aleza Lake Experiment Station (1920's and 1930's)"
File consists of:Original version of Ralph Schmidt's 1993 BC Forest Service publication entitled "The Aleza Lake Experiment Station (1920's and 1930's)"
John Revel - "Devil's Club, Black Flies, and Snowshoes"
Original photographic print included in "Northern Interior Forest Experiment Station: Report of Preliminary Investigations" by Percy Barr. 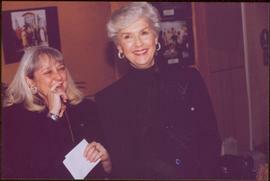 Series consists of transcripts of radio interviews conducted by Bob Harkins at Prince George Radio Station, CJCI. Additional tape summaries created by Archives staff in 2009. 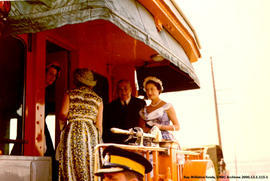 Item is a photograph of Princess Margaret on the back deck of the Royal train's caboose just prior to her departure from Prince George during her 1958 visit to British Columbia.Originally mounted on a poster with photographs 115, 115.2, 115.3. 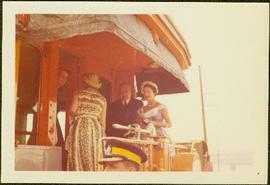 Item is a photograph of Princess Margaret arriving by Canadian Air Forces jet at Prince George. 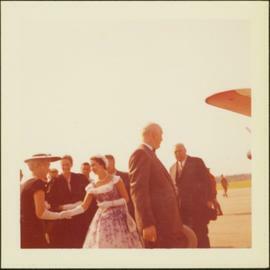 Lieutenant-Governor Frank Ross is walking beside the Princess.Originally mounted on a poster with photographs 115, 115.2, 115.3. 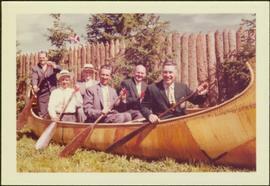 Item is a photograph of Ray Williston and other cabinet ministers paddling a birch bark canoe in the grass during BC Centennial celebrations in Prince George.Originally mounted on poster with photographs 115.1, 115.2, 115.3. 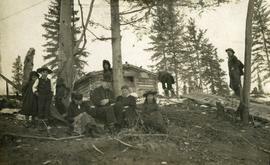 Photograph depicts six adults and three or more children sitting on the ground with a log cabin in the background. Snow scatters the ground in small patches. 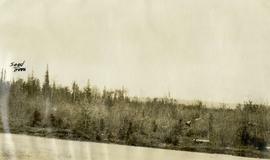 Photograph depicts four men pulling a long canoe across a clearing on a wheeled trailer. Photograph depicts a wide expanse of river in the foreground looking across the water to a narrow clearing along the opposite riverbank. A few building are scattered across the clearing. There is forest in the background. Photograph depicts a view from the river looking at the river bank. There is a canvas tent with forest in the background. Photograph depicts seven or more men relaxing near a canvas tent. Some of the men appear to be whittling wood. Long underwear dry on a tent rope and wood smoke drifts past the men and tent to the forest behind. Photograph depicts several canvas tents set in lush vegetation near dusk. Photograph depicts a view of a lake from a row boat. The back of one male boat passenger and oars are in the foreground. 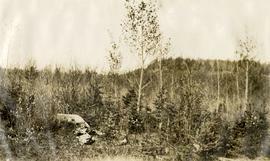 Photograph depicts a view from a hill of a river winding through the forest with marshlands nearby. This may be a double exposure and there is an indiscernible image in the center of the photo. Photograph depicts a view from a hill of a river winding through the forest with marshlands nearby. 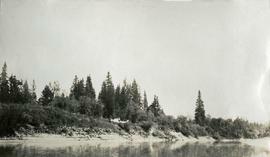 Photograph depicts a view from a high hill, looking down on the Nechako river. There is forest and low rolling hills in the background.